Cartridge yields approximately 1,430 pages. An ink cartridge that redefines the benchmark for color, durability and longevity. Receive exceptional color while increasing your profitability per print. Choose this cartridge when your printing requirements are most demanding. HP 82, (C4913A) Yellow Original Ink Cartridge - HP 82 Ink Cartridges are part of a modular ink system that delivers fast printing automatically. 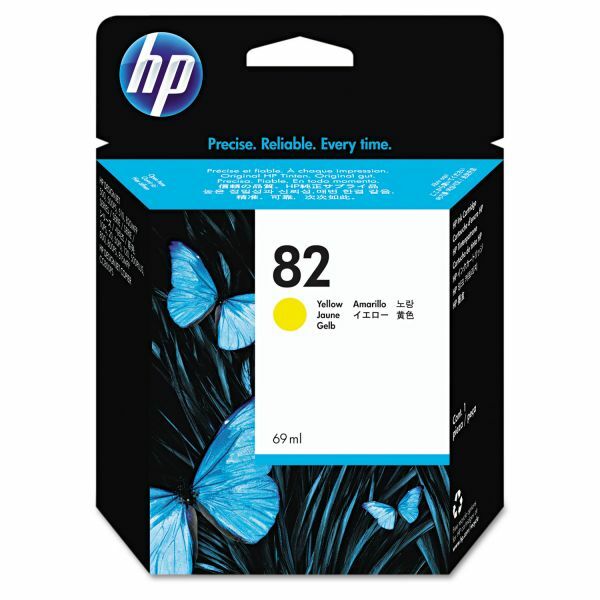 HP 82 Ink Cartridges come in one 69 ml. size and achieve ultimate photo-quality images in concert with the HP 10 Black Ink Cartridge and the HP 11 Printheads. Smart chips embedded into each of the individual printheads and ink cartridges track printhead wear and ink usage and automatically work with the printer to ensure high-quality prints. HP 82 ink supplies are HP engineered and tested to work precisely with the Hewlett-Packard Designjet 500/500PS, 800 series, 815MPF and 820MPF printers and compatible HP printing material to deliver professional results that you expect. On The Insert: This product has a limited warranty. If product is defective, contact HP or your retailer before the end of warranty date. The illustration shows the date marking location. Warranty does not cover empty or refilled products, or products that have been misused or tampered with. If the product is defective, contact HP or your retailer before the end of warranty date.